A high-profile Swiss football referee has been given a three-match ban for insulting fans. Massimo Busacca was pictured waving his middle finger at crowds during a match between FC Baden and Young Boys. He had asked for a warning to be played over the public address system after Baden supporters ran onto the pitch. Mr Busacca said he was provoked by the subsequent "verbal abuse" he received from the fans, but he apologised for his "unsporting gesture". "I lost my cool," he said in a statement. 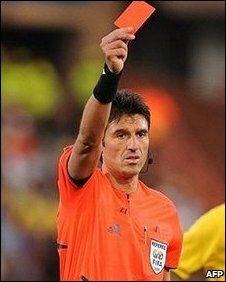 Mr Busacca was in charge at last season's Champions League final between Barcelona and Manchester United and is lined up to referee World Cup matches in South Africa in 2010. The Swiss football association said he was the "best Swiss referee" but that the suspension was to come into force immediately.